Ever since the arrival of the internet in Nepal over a decade ago, demand and access has been increasing. In recent years, internet has become part of daily life for many. But the internet has also troubled many people, with increasing incidents of cyber crimes. Data from Nepal Police’s Crime Investigation Department, shows that in 2011-12, there were a total of nine cyber crime offences; in 2012-13, offence increased to 19; and in 2013-14 (till Chaitra), had surged to 22, with 21 in Kathmandu alone. Most of the cases reported to the cyber crime unit at Hanuman Dhoka are related to social media, particularly harassment, hacking and fake Facebook profiles. Many, however, have argued that cyber crime laws deprive individuals of their freedom of speech and expression, which is enshrined in the Interim Constitution of Nepal. On one hand, freedom of speech and expression includes the right to express views through the Internet, particularly social media. In recent years, social media has played an important role in forming public opinion and holding the government accountable. It has even been used to support causes and for awareness campaigns. The uniqueness of the internet unites people across borders. Such internet campaigns do not require the presence of a mass. Perhaps, this is a handicap for the government as it cannot use force to suppress as well as locate the people involved. Thus, the government tends to regulate the internet. Considering the nature of the internet, governments across the world tends to regulate it. Countries have taken two approaches. First, blocking and filtering information and second, criminalising certain acts like anti-social speech, uploading offensive documents and images etc. Both our neighbours have similar provisions, which deprive the right to free speech on the internet. No doubt, government decisions for regulation would be justified in the larger public interest. But would it be acceptable when regulation encroaches on freedom of speech and expression? Section 47 of the Electronic Transaction Act prohibits the publication of illegal materials in electronic form. It states that any material that contravenes public morality and decency or may spread hate or jealousy against anyone or may jeopardise harmonious relations will incur a fine up to Rs 100,000 or imprisonment of up to five years or both. However, the section is so vague that a mere ‘like’ on Facebook can also be interpreted to fall under the purview of the law. Furthermore, people lack awareness of the law. A recent single judge bench headed by Justice Kul Prasad Sharma of the Kathmandu District Court on Abdul Rahman v Government of Nepal certainly reduced the arbitrary nature of arrests under Section 47. Rahman was arrested after he commented “keko sudhrinu aafnai chori vayeko bike firtauna paisa tirnu pariracha tyo pani 50000” on the Facebook wall of the Saptari District Police Office. The question before the court was, did Rahman’s comment demoralise the confidence of police officers and affect the reputation of the Saptari District Police Office? In this case, the plaintiff continuously argued that the comment posted by Rahman was intended to demoralise police officers and lower the reputation of the police. The court analysed the comment posted and came to the conclusion that the comment didn’t do any such thing and acquitted Rahman. The court observed that “even if it there has been cyber crime through computer and internet, the important question is to find who suffered injury or damage from Rahman’s comment? Prima facie, it seems Rahman’s comment did not lead to sufferance of injury to anyone and in his comment, nowhere does it indicate that police has taken Rs 50,000, it just indicated that a deposit of Rs 50,000 was paid to take away the bike”. Furthermore, the court observed that “until and unless evidence is found, any comment, like or dislike on Facebook cannot be presumed to be against the public interest. Rather, if any article or creation on the internet leads to a violation of social harmony then such act would be brought under the law”. Cases of cyber crimes have been increasing rapidly in Nepal. Due to a lack of awareness about the nature of the offence and existing legal measures, victims are reluctant to seek redress. 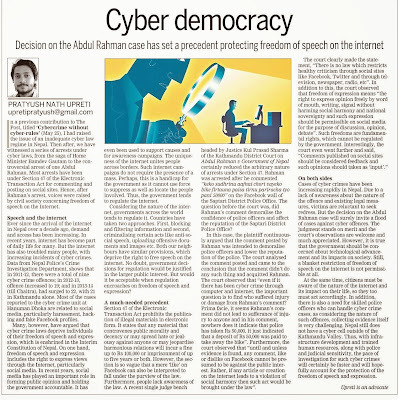 But the decision on the Abdul Rahman case will surely invite a flood of cases against cyber offences. The judgment stands on merit and the court’s observations are welcome and much appreciated. However, it is true that the government should be concerned about technological advancement and its impacts on society. Still, a blanket restriction of freedom of speech on the internet is not permissible at all. At the same time, citizens must be aware of the nature of the internet and its impact on their life, so they too must act accordingly. In addition, there is also a need for skilled police officers who can handle cyber crime cases, as considering the nature of such offences, collecting evidence itself is very challenging. Nepal still does not have a cyber cell outside of the Kathmandu Valley. Thus, with infrastructure development and trained human resources, along with police and judicial sensitivity, the pace of investigation for such cyber crimes will certainly be faster and will hopefully account for the protection of the freedom of speech and expression.